As pastors, we feel confident that we have the one thing needful at our disposal—the Word of God. It will not return to the Lord empty but will carry out the purpose for which he has sent it. Maybe what we are most ill-prepared for is the particular context to which God has called us—a new culture. Most home missionaries don’t have to learn a new language, but we sometimes need to empty ourselves of what we know and enjoy so we can share Jesus with a different culture. Sometimes we push back like Jonah. More often we swim in a mixture of the unknown, the intimidating, and the exciting world that we call home missions. My calling is to an island that in and of itself is a unique place. The Denver Broncos is a household name in only one household—mine. Beef is a luxury. People here dance—and it is not the chicken dance. I have as much rhythm as a jellyfish. Every day I wake up and convince myself that I know nothing but Christ crucified and this is my calling to share. Bringing the gospel to others comes at a personal cost—giving up your own familiar culture to understand and bridge the gap to what is unfamiliar. My challenge is the families whose circumstances and lives are different. Eighty-three percent of St. Lucian children born in 2010 were born into a single-family home. This speaks volumes on the family dynamic. Ricky lives up the street from Trinity Lutheran Church. He lives in a small house made of two-by-fours and plywood. His family makes less than $5,000 a year. Ricky is like most 12-year-old boys. He loves sports, especially soccer. He hates school and has fallen behind. The after-school programs at Trinity provide the educational help his family can’t afford elsewhere. He has few male role models, except for one of Trinity’s pastors, Bramdeo Ramgolam, who has a way of connecting with kids like Ricky. Ricky is nominally Catholic, which means he was baptized and goes to Christmas Eve Mass. Typical to St. Lucia, he has a one-in-five chance of graduating high school with passing marks. He is back and forth between his mother’s house and his father’s house. His mother’s current boyfriend has been accused of molesting Ricky’s older sister. One afternoon, Ricky hid in church to avoid the domestic violence in his house. Such conflict is the rule rather than the exception. Statistically speaking, Ricky will be unemployed until at least 24. He will not have enough academic background to hold a middle-class job. He will be related to someone who is murdered. He will know what a church is but not who Jesus is. He will father children but struggle at being a father. We have a greater power than culture or statistics: Christ crucified and him alone. What does a day in the life of a home missionary look like? Simply put, it means emptying yourself of everything you know except Christ crucified. It means figuring out how to bring the gospel to a kid like Ricky. My job is personally challenging. I feel equipped with the Word but grossly inadequate in personal traits. My job is exciting, exotic, frustrating, challenging, and sad on any given day. But my calling is filled with joy: “Come, let us sing for joy to the Lord; let us shout aloud to the Rock of our salvation” (Psalm 95:1). My calling in Christ is confident: “The righteous are as bold as a lion” (Proverbs 28:1). I love being a home missionary. Tom Spiegelberg serves as a home missionary at Trinity, Castries, St. Lucia. Learn more about WELS mission work in St. Lucia. God is richly blessing the work of WELS Home Missions. Missionaries and their members are finding ways to share God’s good news with friends, relatives, neighbors—and sometimes even strangers at local fast food restaurants. Here are some of their stories. Michele is a member of Beautiful Savior. She stopped at McDonald’s one night and happened to have on her T-shirt from our soccer camp the year before. As she was eating, she heard some children debating whether the imprint on the shirt was, in fact, a soccer ball. Michele seized the opportunity to tell them that it was a soccer ball. She then told them about Beautiful Savior’s soccer camp and gave them our website so that they could register and participate. And they did. They attended and proudly wore their own shirts imprinted with a soccer ball logo on the front and the 2016 theme on the back: “I press on toward the goal in Christ Jesus.”—Philippians 3:14. Kevin Boushek, home missionary at Beautiful Savior, La Porte, Ind. Nicole Balza, a staff writer for Forward in Christ magazine, is a member at Bethlehem, Menomonee Falls, Wisconsin. Learn more about WELS missions in North America. Having served as Home Missions administrator for more than five years, it has been extremely gratifying to see how God is blessing his Word through Home Missions efforts. God’s Word is powerful and continues to change hearts. The proof is seen in the work of mission after mission. In the spring of 2013, one of my sons was assigned to a new mission. During the first months, he made a lot of outreach calls and contacts. One contact was with a couple who had some life problems. Due to medical reasons, she was wheelchair-bound, and for many years, he had abused drugs. They began taking Bible classes and heard about the life-saving work of Jesus. Through the Spirit’s work, they were led to faith in Christ and confessed him as Savior. About a month later, the gentleman had a heart attack and died. My son was able to share words of comfort and encouragement to the group who gathered for the memorial service. Praise God more people are hearing about the Savior through WELS Missions. This year, the Missions team—Home Missions, World Missions, and the Joint Mission Council—is excited to introduce a new theme: “Every neighbor, every nation—WELS Missions and you.” In Home Missions, we so appreciate your Congregation Mission Offerings and the steady support of your special gifts, which allow us to reach souls with the gospel. Through your gifts, WELS is undergirding almost 80 home missions with financial support. So many active ministry partners are aiding mission congregations to share the one thing needful—the precious Word of Truth. Thank you, Lord, for these blessings. • encouraging members in cross-cultural ministries to share the gospel with family and friends living in their countries of origin and financially supporting that as appropriate. In addition to supporting existing missions, Home Missions and its district mission boards continue to explore new places to start missions. Since 2013, Home Missions has authorized 32 new mission fields, including 8 this year. In these missions—as in all our churches—the focus has been to tell more people that Jesus came to be their Savior from sin. People lost in sin are being made alive in Christ as God’s people share and share and share again the Name that is above every name. Not every witnessing opportunity will lead to new members, but more people now believe they are saved by faith in Jesus. No longer do they think it is up to them to earn their way to heaven. No longer are they doomed to everlasting destruction. They are heirs of heaven. Until the Lord returns, may God continue to bless our efforts to tell every neighbor and every nation the praiseworthy deeds of Father, Son, and Holy Spirit. Adele Kapellusch learned about the campus ministry program at the University of Arizona in Tucson her senior year of high school. An Arizona Lutheran Academy choir stop at Grace, Tucson, cemented her decision to attend that college. She graduated from the university in December 2015 with degrees in neuroscience and physiology and credits the campus ministry program with helping her stay connected to Christ. “U of A has a great science program, but it was really important to me that I had a church. Grace was across the street from the university, so I had a church that was really close to my dorm, and I knew I would have the opportunity to go to Bible studies and church,” Kapellusch says. Amanda Klemp, WELS editorial projects manager, is a member at Living Word, Waukesha, Wisconsin. Need some spiritual support and encouragement while you’re at school? As a college student you can get bothForward in Christ magazine andMeditations, a book of daily devotions, mailed to you for free. Twice a year, Illumine holds a free yard sale. We prepare food and coffee for all who visit. Hundreds of people stop by, some in great need, all encouraged by the thought that churches can still be generous. During our first sale, a young family who had worshiped with us a couple of times came to peruse the goods. They had a one-year-old boy and another child on the way. During the sale, the mother asked me what she needed to do to get her little baby boy baptized. The family was eager—they wanted to have the baptism right then and there, We gathered up everyone who was shopping and volunteering, brought them all into the sanctuary, and laughed and applauded as this little boy was washed clean of his sins through the precious gift of baptismal grace. It was a great day to be a mission church! Kent Reeder, home missionary at Illumine, Rock Hill, S.C.
David and Kris Hart and their kids became members at Amazing Grace, Myrtle Beach, S.C., in January 2015. Across the cul-de-sac from their home, Nick and Angel Santangelo lived with their son, Gavin. David and Kris’ son, Ryan, played frequently with Gavin and invited Gavin to come to church with him. David and Kris Hart and family. Ryan Hart pictured in front left. As Angel Santangelo explains, she and her husband felt it was important to raise their son in the Christian faith but wanted to look beyond the Catholic and Baptist churches in which they’d been raised. Ryan helped them take the next step with his invitation to visit Amazing Grace. Ben Zahn, home missionary at Amazing Grace, followed up with the Santangelos the next week. They asked about Baptism since Gavin had never been baptized. After digging into the Scriptures and talking about Baptism, the Santangelos asked Zahn to baptize Gavin the next Sunday. Soon Nick and Angel attended Amazing Grace’s Starting Point class, where they learned more about God’s Word and how to apply it to their lives. Pastor Alvien De Guzman, a native Philippine missionary, serves a small flock of faithful believers in a suburb of Manila. They are using videos and printed materials from Multi-Language Publications to reach out to the unchurched in their community and are looking to begin ministering to prospects in outlying areas. WELS supports De Guzman and Law and Gospel Evangelical Lutheran Church with monthly contact and additional resources. Iliyan Itsov, a pastor in the Bulgarian Lutheran Church, has a new mission project in Europe: outreach to Roma (gypsies). A Roma himself, Itsov has a unique understanding about how to share the gospel with the western world’s most mistreated ethnic group, a group numbering about 10 million people. He ministers to the Romani in five villages in Bulgaria, including training leaders in each village to conduct worship. Pictured is a new group in Zlataritsa, Bulgaria, where a core group of 17 Roma worships weekly using sermons Itsov provides. Itsov is also working with WELS sister churches in Europe to gather groups of Roma workers and immigrants whom these sister churches will then serve. Liberian spiritual leader Isaac David is reaching out to legal immigrants in Las Vegas, Nev., as well as working to establish the Confessional Lutheran Church in Liberia. He opened a church in Las Vegas—the Chapel of Improvement Christian Fellowship—and is working closely with Water of Life in Las Vegas. He also is studying with local WELS pastors. David and several WELS pastors traveled to Liberia in April 2016 to train leaders and members (pictured in top photo) and to attend the church body’s first convention. •Rockwall, Texas: Connected with Divine Peace in Garland, Texas, this multi-site mission will have two locations for worship, but one leadership team and budget. More than 20 members from Divine Peace are living in the target area. •Victoria, Texas: A second pastor will be needed to serve this new multi-site mission outreach by Redeemer, Edna, Texas, as the pastor at Redeemer offers both English and Spanish worship each Sunday. •Stevens Point, Wis.: In 2015, Divine Word, Plover, Wis., called a second pastor to focus on campus ministry at UW–Stevens Point as well as reach out in the community. Recently, Divine Word purchased a building for a campus center and second worship site. •Meridian, Idaho: Cross of Christ, Boise, Idaho, is starting this multi-site mission to serve families living in the neighboring city of Meridian. •Coeur d’Alene, Idaho: Members of St. Matthew, Spokane, Wash., will support this new mission, located about 35 miles away. More than 25 adult members will make up the launch team that will work with the mission pastor. •Lehi, Utah: Prince of Peace, Salt Lake City, is starting this mission south of Salt Lake City in an area that has a strong Mormon presence. •Fredericksburg, Va.: Members from Trinity, Woodbridge, Va., are eager to start a mission in this growing community about 40 miles away. •Atlanta, Ga.: The city of Atlanta is ringed by seven WELS churches. Over the past two years, WELS members have been holding Bible studies in the city, and a core group has been established. For 53 years, the Lutheran Women’s Missionary Society (LWMS) has been increasing awareness of, interest in, and support of WELS mission outreach. More than 1,100 women met at the recent 2016 national convention in St. Charles, Ill., to learn more about missions and to show their support. About $53,000 was gathered during the convention for mission projects, and more than $143,000 was received throughout the year. Get missions updates and other ministry news with the Together e-newsletter and video updates. Subscribe today! Growing up in the mid-1960s, Greg said his mom would drop him off at church on Sunday, but she did not attend. Greg learned about Jesus in a general way, but inconsistencies made it difficult for him to connect with Jesus in a personal way. Things changed when he was 14. The offering was taken, and the plates were brought forward. The pastor received them and announced, “You can do better,” so he passed them back to the ushers for a second round. That was the last time Greg attended church. Fast-forward 42 years. Greg’s wife, Joloyce, began attending The Springs, a WELS home mission in Sparks, Nevada. At first Greg did not attend. He drove her to church but stayed in the car to read. Eventually Greg joined her for worship and attended congregational meals. About six months passed. It was time to invite Greg to join the new Bible information class, but Greg wasn’t feeling well. He was diagnosed with stage four stomach cancer. But while cancer was doing its thing, the Holy Spirit was at work doing what he does. At the services Greg attended, he heard the Word of God, and the Holy Spirit created faith in his heart. Greg now warmly welcomed visits and devotions. He discovered the love of other believers, expressed through their phone calls, cards, and compassion. We filled a bowl with water and rejoiced. With God’s Word, the water became a wonderful water of life. The Holy Spirit bestowed upon Greg the blessings of Baptism—forgiveness of sins, salvation, and the assurance of eternal life. It was an incredible moment. Greg’s health declined rapidly. One morning, we stood by Greg’s bed reading Scriptures, praying, and singing hymns. Then we sat around the kitchen table. A few minutes later, Joloyce walked back to Greg, and his labored breathing had ended. His eyes were closed. Greg was home with Jesus. I stayed with Joloyce into the afternoon. We closed with a devotion on Psalm 130, “I wait for the Lord, my whole being waits, and in his word I put my hope” (v. 5). Greg’s waiting was over. Now Greg’s new day had dawned. No more cancer. No more pain. Just Jesus and the joy he promises. I left with several bags of pennies. A few weeks earlier, Greg had mentioned that he wanted his coins to be put in our congregation’s building fund. My sons counted the rolls—9,650 pennies, or $96.50. The next day, Joloyce said that they found the rest of Greg’s coins. This time it wasn’t just pennies, but nickels, dimes, and quarters too. The total rose to $516! The following Sunday’s Gospel lesson was the story of the sinful woman who poured oil on Jesus’ feet. She knew she had been forgiven much, and she wanted to express her love. Near the end of the sermon, I shared Greg’s story and placed his envelope in the offering plate. Greg had been forgiven much. Greg loved much, and he wanted to share what he had to help others know of Jesus’ love. This is why we plant missions and share the gospel. Some might say this happened just in the nick of time for Greg, but it was all in God’s timetable. We at The Springs were privileged to be God’s instruments, sharing his love and grace. Steven Hillmer serves as a home missionary at The Springs, Sparks, Nevada. The campus ministry in Ottawa, Ontario, Canada, calls itself “Illumine.” The name, which has served them to “bring light from the Scriptures,” reflects how the group studies the Bible. “When I met with a few university students after I first got here and asked them what they wanted out of campus ministry, they said, ‘If you’re going to do a fluffy Bible study, we’re not particularly interested,’ ” says Luke Thompson, campus pastor. That ambitious attitude from the students set the tone for the growing, three-year-old campus ministry. Thompson focuses on two aspects to the ministry. The first is weekly socials, where the students get “the best meal they’ve had that week” followed by an in-depth Bible study. “We go all out on the dinners and have things like ribs, Mexican, or Indian food,” says Thompson. St. Paul congregation sets aside part of its budget for the meals, which are held in Thompson’s home. Thompson says a key component to building a relationship with the students is letting them know they have a “home,” a go-to where they can be comfortable. The socials usually draw about 20 people. About one-third to one-half of the participants come from a Lutheran background. The others either have no background with Christianity or come from nominally Catholic homes. They are hungry to dive into Scripture. “We basically have two types of students who show up. One is your WELS member looking for a community to find like-minded people and other conservative Christians. But the other half, the friends they invite, have no Christian background or very little Christian background, and they’ve never been exposed to apologetics, deep doctrine, or treating the Bible historically,” explains Thompson. He continues, “Our Bible studies are very rigorous. We spend a lot of time on the historicity of the New Testament—looking at things like the transmission of the New Testament documents and texts, the reliability of them, the formation of the canon, the historical backgrounds of the gospels, and the historicity of the resurrection. This is the first time many of the students are exposed to this, and they get kind of addicted to it.” Several of the Bible study participants continue studying at the church’s Bible information class not necessarily to become a member but to get a strong, formal introduction to Christianity. Many of the weekly Bible study attendees started by attending an Illumine Talk, the second main aspect of the campus ministry. These presentations look at elements of pop culture with a view toward literary criticism and Christian apologetics. Once each semester, Thompson will take a topic—ranging from zombies and contemporary fantasy to the modern anti-hero—and use it to examine human nature and how it reflects truths from Scripture. Then he shares the gospel. About 50 students attend, most of whom are not involved in campus ministry or a church at all. Thompson’s goal is to offer the most non-confrontational way possible for students to invite friends to an event that shares God’s Word. In a multicultural college community that is overwhelmingly non-Christian, one of Thompson’s big goals is to equip the students to talk about the Bible like a New Testament apostle. He wants to remove the commonly defensive statement, “I believe,” from their faith vocabulary, particularly relative to opposing beliefs. He explains, “When you read the New Testament, they talk in a very different way. It’s not about ‘what I believe’ or something abstract, but they’re talking about real, historical, concrete events that took place.” He wants his students to share the gospel in the same way—sharing that it’s real and why it’s real. Need some spiritual support and encouragement while you’re at school? As a college student you can get both Forward in Christ magazine and Meditations, a book of daily devotions, mailed to you for free. Each year, pastors originally from Thailand, Laos, Vietnam, and Korea meet at Wisconsin Lutheran Seminary to discuss their plans for reaching out and expanding their ministry. These men are the spiritual leaders and drivers of outreach to Asian peoples in North America and overseas. One of these pastors (name withheld for safety reasons) is from a country that is in the top 30 countries that persecute Christians. Those who reject ancestor worship, animism, or Buddhism are either removed from their villages or beaten. This graduate of the Pastoral Studies Institute could safely stay in the United States and pastor the people he serves. Instead, he and his wife choose to spend their own money to travel back to their country of origin. There they risk their lives to tell people about the one true God. On his first trip, he spoke to a group about marriage. “The women were crying. I was teaching the husbands that God says to love their wives,” he says. They had never heard that before, and it brought them to tears. They begged him to bring Bibles the next time he came. So he did, even though it could put him in grave danger. As he walked through security, he had Bibles in his backpack. “At the gate they searched all my luggage. Except my backpack. I went through and gave away all the Bibles,” he says. Meet a medical assistant in Southeast Asia who travels from village to village on his motorbike to share his medical skills with his patients. He also shares the gospel. This man, who became a Christian when he was a child, wants to learn more about his faith so he can share more with others. To do that, he takes classes through the seminary’s Pastoral Studies Institute via Skype. Twice a year, he travels to the United States to take classes. Linda Buxa is the communications coordinator at Wisconsin Lutheran Seminary, Mequon, Wisconsin. Find out about more WELS Mission work in Asian countries. Residents and caretakers of a local adult care home join members at Spirit of Life, Caledonia, Mich., for worship every Sunday. As Allen Kirschbaum, home missionary at Spirit of Life, reports, “Our members love to walk out to the cars and guide the residents into our sanctuary. Each month we have activities for those residents, such as making decorations for our Christmas trees and a Christmas play. Their faith is a massive encouragement to a young mission congregation. Crown of Life, Cadillac, Mich. When I was assigned to Crown of Life as a home missionary, I knew that a major part of my job would entail sharing the gospel with the unchurched. But after my first nine months and no one interested in Bible information class, I was pretty down on myself and on the work. But the Lord had a plan. On the day my daughter was baptized, a young couple visited our church. They were expecting twins and looking for a church home. After the service, I talked to the couple and invited them to our potluck. They talked to more people and decided to enroll in Bible information class. Four months later, I confirmed the parents (my first confirmands) and baptized the twins in the same service. Three years later, they are faithful in worship and Bible class. This fall, they will be part of our inaugural preschool-aged weekly Bible camp. Jeff Sonntag, home missionary at Crown of Life, Cadillac, Mich. The Rev. Dr. Kebede Yigezu is the founder and president of the Lutheran Church of Ethiopia (LCE). With more than three hundred members, the LCE proclaims a solidly Lutheran confession to the people of Ethiopia. The LCE’s Maor Theological College serves as a strong anchor for this heritage. Three years ago, Kebede contacted WELS to discuss fellowship possibilities. In 2014, Peter Bur and Prof. E. Allen Sorum met with this group of believers. In September 2015, Kenneth Cherney, a professor at Wisconsin Lutheran Seminary and a member of the WELS Commission on Inter-Church Relations, visited Ethiopia and participated in Maor Theological College’s first graduation ceremony. “A huge amount of amazing things are already done. The LCE is on the way to being in fellowship with the Confessional Evangelical Lutheran Conference. Through gifts of WELS people for Maor college and seminary program, the group is stabilizing its presence by purchasing land and building the first floor of a multi-floor facility,” says Sorum. That building will provide more ways to support this growing church body. In addition, through the world mission seminary program, a professor will visit the church in 2016 to teach a course. “Rev. Dr. Kebede continues to meet other people in WELS, and every time he meets someone, it’s another person who is appreciative of his unconditional, confessional heart,” says Sorum. Find out about more WELS Mission work in African countries. With 230 members, Immanuel Hmong, St. Paul, Minn., is the largest US WELS Hmong congregation. But it’s not only concentrating on spreading the gospel message in Minnesota. Since fall 2015, Immanuel Hmong has been livestreaming its worship services to broaden the spread of the gospel to Hmong people around the world. “This will help us to share the gospel to places where we are not able to go or where our people do not have a church,” says Pheng Moua, pastor at Immanuel Hmong. WELS Hmong members also can tell their loved ones around the world about this opportunity for weekly worship. About 50 people watch every week from places such as Thailand, Vietnam, France, Australia, East Asia, Laos, and the United States. Immanuel Hmong also was the site of the recent WELS Hmong National Conference (pictured), in which Hmong pastors and laymembers from around the world strengthened their faith through worship and Bible study and learned more about each other’s ministries. • Grace Hmong, a home mission in Kansas City, Kan., that recently obtained its own worship facility through a special grant and loan from WELS Church Extension Fund. • Faith Hmong, Anchorage, Alaska, which shares a building with Faith Anglo, a congregation reaching out to Spanish-speakers. • Mount Calvary Hmong, a congregation supported by La Crosse, Wis., area WELS churches. • Trinity Hmong, Manitowoc, Wis., a congregation that grew out of a 30-year mission of First German to reach an immigrant community in Manitowoc. • Christ’s Gospel Hmong, Clovis, and Faith Hmong, Fresno, two newer California congregations reaching out to family and clan members in the area. One pastor and his wife from Thailand also attended. Julie Wietzke is managing editor of Forward in Christ magazine. “Around 15 million Hmong are living in darkness. They are oppressed, not only by the power of the devil but also by the power of men,” says Bounkeo Lor, a native Hmong man trained as a pastor through the Pastoral Studies Institute of Wisconsin Lutheran Seminary. Lor has a passion for reaching out to his Hmong brothers and sisters. With a foot in outreach in both the United States (pastor at Grace Hmong, Kansas City, Kan.) and abroad (teaching leadership workshops in Vietnam), he is a natural pick as one of two Hmong pastors serving on the WELS Global Hmong Committee, a group that oversees Hmong ministry around the world. In January, the Global Hmong Committee met with Hmong national pastors and lay leaders in Thailand to share ministry developments and to discuss further opportunities for working together. Worldwide in WELS, 25 Hmong pastors serve 8 ministries in the United States and 15 congregations and preaching stations in Thailand and the surrounding area. In addition, there are new opportunities for further Hmong outreach in Vietnam and East Asia and potential for new ministries in the United States. Lor shares that family, or clan, connections are strong in the Hmong culture, tying these world and home mission fields together. This, he says, makes a joint committee all that more important. “We need each other for the growth of the Hmong ministry,” he says. Both he and Pheng Moua, the other Hmong pastor on the committee, are thankful to be part of a group that is working to further Hmong outreach around the world. After serving as a Lutheran pastor in Mexico for 10 years—a role he treasured—Carlos Cajas retired. Before stepping away from the ministry, Cajas’ health wavered and then faltered. He was diagnosed with heart troubles and diabetes. “Sometimes I had to sit down while preaching a sermon,” he recalls. The future for Cajas in his retirement looked as bleak as his health conditions. Over time, however, he saw God still had a plan for his life and, better yet, he saw an opportunity to reach thousands with the gospel message from his own home. Cajas had always had a strong desire to share God’s Word with others. After working in a factory in Mexico for 15 years, he decided to leave his position as supervisor behind to be a pastor. He completed his seminary training and went on to serve in various places in Mexico City and Puebla, about 60 miles southeast of Mexico City. As his years of service drew to a close, Cajas faced a debilitating heart condition and also open heart surgery. Then diabetes struck his eyesight, leaving him legally blind. Cajas lives with his family in Puebla, where his wife, two grown children, and other relatives help oversee his medications, doctor visits, and daily activities. Not long ago, his son gave him a tablet. Cajas found that by holding the tablet inches from his face and using a magnifying glass, he could read the words on the screen. His efforts coincided with those of Academia Cristo, a site that offers free Christ-centered resources to Spanish speakers around the world. Those involved with Academia Cristo’s Facebook page spotted Cajas’ efforts and asked him to participate. Greetings in the name of our Risen Savior! I am always thanking God for you and the amazing partnership we share in our Lord and his mission. These thoughts are often in my heart and prayers, but not only in mine. As I travel to any of our 23 world mission fields, there is one request I hear everywhere: “Please, greet our brothers and sisters in WELS and tell them how much we appreciate the gospel your missionaries carried and the ongoing work we share.” More than 200,000 people are growing in their faith and understanding through the efforts of WELS World Missions. No human plan could have foreseen the incredible ways God has used us in his kingdom. And I know we are not done. God’s mission is still found in the billions of people throughout the world who do not yet know the Savior as we do. God’s Holy Spirit is still at work, and Jesus is coming soon. Our worldwide mission is still before us. In many ways the far reaches of our planet are closer than ever. Immigrant groups from all over the world are now living in WELS neighborhoods in America. The Internet and social media communication allow instant contact through cell phones that are used almost everywhere. The expanding church bodies in our global fellowship are eager to reach other countries with the peace they now enjoy. The fracturing and decay of large European and North American church bodies that have set aside their Bible compass have left their former mission partners searching for someone who still believes the Bible is God’s Word. Opportunities that were hard to imagine a decade ago are a growing cry for help before us. WELS Missions has been mobilizing to meet these needs. In the pages of this magazine, you will read about some of these new initiatives. A Global Ministry Committee is now in place to help immigrants who have become WELS members bring the gospel to their family and friends back home. Academia Cristo and other Multi-Language Publications efforts are reaching millions every day with gospel gems, and thousands are signing up online to learn more. Our missionaries work with the churches they serve to explore the potential of new contacts in neighboring countries who still live in darkness. WELS Missions has partnered with Wisconsin Lutheran Seminary to form a three-man team to organize and deploy WELS teaching manpower and resources to give requested pastoral training to more than 300 men in places like Ethiopia, Nepal, Pakistan, Vietnam, Guatemala, Venezuela, Kenya, Liberia, East Asia, and more. The Lord has thrown open these doors before us. We don’t need to imagine what God might use us to accomplish. Their pleas are right before us. Trusting in Jesus’ promise to be with us and the power of the gospel he has placed in our hands, we are ready. Enjoy these mission stories. Pray for the people who need God’s peace. Ask God to use us to do even more. Many Hispanics in the United States have close ties to other areas in Latin America. For Hispanic Lutherans, the desire to share Christian resources with relatives and friends in other areas is often strong. Occasionally, Hispanic members are even looking for a new church home as they head back to Central or South America. In the past, sharing gospel resources with those south of the border was frequently a challenge. Congregations are spread out, and travel distances between them are often great, making it difficult for those interested in attending worship. Today, through online resources such as academiacristo.com, which offers free Christian materials to Spanish speakers everywhere, that is changing. “We have such a diverse congregation,” notes Abe Degner, pastor at Christ the Lord, Houston, Texas, which serves a Spanish-speaking population in the area. With members from more than ten different Spanish-speaking countries in Latin America, when it comes to the opportunity to use sites like Academia Cristo, “there’s a lot of potential,” he explains. Twice when members moved back to areas south of the border where there were no nearby Lutheran churches, Degner directed them to these online resources. Two women involved at Christ the Lord lived in El Salvador during their early years. Now in Houston, they have used Academia Cristo as a way to share the gospel with family members back home. “We live in a world of rapid change, and this is true also in the area of theological education as the line between home and world missions disappears,” says Bradley Wordell, world mission seminary professor at Wisconsin Lutheran Seminary (WLS), Mequon, Wis.
One of the changes in education comes because of circular immigration. As God brings refugees and immigrants to the United States, congregations reach out to them with support and the gospel. “Then they have the desire to learn more, to share the gospel with other immigrants, and to bring the gospel back to their home countries. They introduce to us candidates for gospel ministry,” says Wordell. This circular immigration gives us a complete partnership in the gospel. The second group of people who are changing the education landscape are Christians throughout the world who have already gathered together in groups, churches, and communities. They want support, training, and connection to a church body that shares the good news that Jesus has done it all and that the Bible is true. Until now, the seminary has handled these requests through two programs, the Pastoral Studies Institute of Wisconsin Lutheran Seminary (PSI) and the world mission seminary program. The PSI helps non-traditional students through its preseminary and seminary training. PSI director E. Allen Sorum works with local pastors to help provide training for North American-based students. For the world mission seminary program, WLS professors travel throughout the world teaching courses in seminaries that are part of the Confessional Evangelical Lutheran Conference. In 2015–16, 7 members of the seminary faculty administered 10 different courses in 9 countries to more than 100 students as well as 100 pastors and a few members. 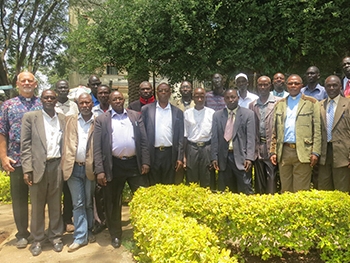 PSI director E. Allen Sorum (far left) traveled with Peter Bur, a South Sudanese pastor, to Kenya in 2015 to meet with and train spiritual leaders for South Sudanese refugees as well as pastors in a Kenyan church body looking to establish fellowship. Today, more than 300 potential students are contacting our church body looking for support and training in their journey toward becoming confessional Lutherans. With the abundance of people reaching out, the scope of requests is beyond that of missionaries to handle while serving their people and is more than the seminary faculty can undertake while maintaining a high level of education on the Mequon campus. To address this God-given opportunity, the Synodical Council approved a position of international recruitment director. Jon Bare, a 2008 graduate of Wisconsin Lutheran Seminary, began serving in this position in summer 2016. “The creation of this team connects World Missions, Home Missions, and Wisconsin Lutheran Seminary in a new and exciting way,” says Bare. His task is to coordinate with the world mission seminary professor and the PSI director to implement a culturally informed vetting process for individuals as well as church bodies who wish to become part of our church body’s worldwide outreach. This team will administer a curriculum for men in America and abroad who want to serve as pastors in these church bodies. Bare will work closely with Sorum and Wordell to also develop an appropriate assessment of skills and abilities in ministry and negotiate the appropriate degree or certificate that the student would receive upon the completion of his given level of training. Opportunities to reach every neighbor and every nation. The time is now. Learn more about how the Pastoral Studies Institute is training men to pastors around the world. Normally, when we do something to help or benefit someone else, our motivation is not to receive thanks. Our motivation is to show Christian love and to do something for someone with no hope of receiving anything in return. But no one would deny that we do welcome it when people thank us for our kindness and acts of love. It assures us that what we did really means something and is appreciated. Mark Schroeder installs Jonathan Bauer as the pastor at a mission congregation in Mount Horeb, Wis.
Several years ago, I had the opportunity to visit several of our sister churches in Africa. While I was there, I was able to attend the very first meeting of representatives from our five sister church bodies in Africa. All five African synods were either begun as a result of WELS mission efforts or have been supported by WELS World Missions. For three days, pastors and several lay representatives from Zambia, Malawi, Nigeria, and Cameroon met together to share ministry challenges, to discuss biblical doctrine, and to encourage one another in their mission of proclaiming the saving gospel. Near the end of the conference, one of the lay members in attendance asked the chairman if he could address the group—especially his American brothers. He was an older man, and he made his way slowly to the center aisle of the chapel. When he got to the aisle, he knelt down on both knees. I will never forget what he said. We do not work to carry out the mission God has given us to receive thanks. The very fact that God has given us the privilege of doing this work is something for which we can and should be thankful. But even though we do not do this work to be thanked, it is a special blessing to hear words of appreciation from people who recognize the special treasure that God has given to them, a treasure that we have been privileged to share. As we work together on the mission God has given us, we know that the gospel is being shared with people whom we may never meet this side of heaven—both here at home in the United States and also around the world. We should never forget the impact that this work has on people—an eternal impact—for which they are truly grateful to God and to us. I join our African brother in thanking you for your support of our mission efforts through your prayers and through your offerings. I know that you don’t do it for the thanks, but you should know that your work in the Lord is not in vain and that it is truly much appreciated. Let us continue to work so that every neighbor and every nation hears the gospel message about the One who saves. Santo Tomas, Phoenix, Ariz., has been reaching out with the gospel since 1997. Every week Jorge and his wife, Gaby, along with their daughter visit homes throughout the west valley of Phoenix. They lead adult and children’s Bible classes and activities, all with the goal of bringing Jesus and his love into their lives. Jorge is a volunteer evangelist for Santo Tomas and serves on its church council. Gunnar, the son of a member family, goes to a university about an hour-and-a-half away. While away, Gunnar began dating Holly. When Gunnar would come home, he came to church. Holly came too. After the first couple of visits, I noticed that Holly was really attentive during the sermons. Since Gunnar would usually stay for Bible class, she would too. So we got to celebrate an adult baptism—one more 20-something the Lord added to our small group. As a congregation, we were ecstatic. I know that the “nones” (those who say their religion affiliation is “none”) are on a rise, but I have evidence in our small congregation that the Word of God is still powerful enough to change people. We are a congregation meeting in a conference center with digital music and with a small group of people, Who would want to come? On paper, it doesn’t make sense. But it doesn’t have to, because our message is the power of God for salvation. Aaron Goetzinger, home missionary at Redemption, Watertown, N.Y.
“As I teach adults English as a Second Language (ESL), my favorite class is the one where we use simple sentences about Jesus as our Savior,” says Eileen Zanto, a home missions staff minister at Christ, Denver, Colo. Zanto is pictured here with graduates of one of her ESL classes. After Pentecost, Luke described the church in Jerusalem as a remarkable gathering. They were concerned about the truth; they prayed; they even sold property and possessions to help those who had little. Later, when the apostle Paul traveled from place to place, the same remarkable gatherings arose. And if you read the last portion of the book of Acts, you might be struck, as I was, at the joy the people had as they met Paul and other Christians and as they heard how the Holy Spirit was bringing others to faith. So here we are two thousand years later. I hope these pages will bring you joy and encouragement. This special issue shares the stories of how the Holy Spirit is still adding to the church, just as he did at the beginning. New York City, Myrtle Beach, and Boise replace Ephesus, Corinth, and Berea. East Asia, Mexico, and Nepal replace Galatia, Italy, and Cyprus. The names attached to these stories replace Paul, Silas, and Timothy. As we rejoice, we should also be encouraged. His kingdom continues to come as we pray so often. Among us, let us continue to pray not only for these missions but for called workers to send. Among us, let us work to reach out in our communities to every neighbor and every nation. Among us, let us renew our efforts to use our financial resources to bring the joy of the gospel to others. When Peter Bur emigrated to the United States, no one could have anticipated how God’s plan would unfold—and how a ministry would explode. Peter Bur, originally from South Sudan, began worshiping at Good Shepherd, Omaha, Neb., in 2010. Already serving as a spiritual leader for Sudanese immigrants, he started taking classes with Michael Ewart, pastor at Good Shepherd, to deepen his training. Ewart then assisted Bur to become a student in Wisconsin Lutheran Seminary’s Pastoral Studies Institute (PSI). The more Bur learned, the more he connected other South Sudanese people to WELS congregations all throughout North America. Peter Bur training South Sudanese spiritual leaders serving refugee camps in Ethiopia. These leaders are studying a simplified version of Luther’s Small Catechism translated into Nuer, which Multi-Language Publications helped develop. In 2015, Bur graduated from the PSI and was called by the WELS Joint Mission Council to serve as the coordinator of South Sudanese ministry for WELS, overseeing the pastoral training of South Sudanese leaders in North America who are studying with their local pastor. Bur is also reaching out to pastors and spiritual leaders in Africa who are serving South Sudanese refugees. In 2016, for the third year in a row, Bur and Sorum encouraged the men who are serving the ever-growing groups in refugee camps in neighboring countries of South Sudan. Bur taught a simplified version of the catechism, which he translated into Nuer, and also spoke on protection from demons. From the South Sudanese work, connections have been made in Kenya and Ethiopia, all because one Sudanese man sought out one American pastor and they worked together. From one neighbor to many nations. Pastor Mark Anariko Onunda in front of the piece of land where his congregation worships. He hopes to build a church here. Onunda is the chairman of the Lutheran Congregations in Mission for Christ, which seeks fellowship with WELS and ultimately the Confessional Evangelical Lutheran Conference. It was Alexis M.’s second day in Ottawa as she began school at Carleton University, and she wanted to worship that Sunday morning. This biomedical and electrical engineering student saw St. Paul was open and holding services, so she went in and sat down. That is how she came to learn about Lutheran doctrine and to start the next chapter in her faith life. Luke Thompson holds weekly dinners and Bible studies in his home for the campus ministry in Ottawa, Ontario, Canada. After her first chance visit there, Alexis continued to attend every Sunday and joined Illumine, the church’s campus ministry group. “One thing I really like is, when talk-ing to Pastor Thompson, everything is referenced to the Bible,” she says. Alexis grew up in a Catholic home and attended Catholic schools. Getting into the Bible has opened her eyes to the message of salvation through Christ alone. “For me, someone who is trying to grow in their faith and spend more time with God and spend time trying to understand the Bible, being able to see where the verses correlate with each other, where things come into place in the Bible, is so very important,” she says. Her parents, active Catholics, are supportive of her scriptural and faith pursuits through Illumine. While she hasn’t been confirmed yet, she has taken classes and considers St. Paul her church home. The Illumine group, she explains, is supportive and encouraging. “I highly recommend that any Lutheran church that can have this program should have it, because it gives students a place to go and feel welcome and know that just because they’re Christian does not mean they can’t have fun or can’t interact with others. They can spend time learning about the Word of God,” says Alexis.